To add a fixed, unchanging image onto a form, you can either drag the image file from the Finder onto the form or copy the image and paste it into the form (which must, of course, be in Graphics Mode). 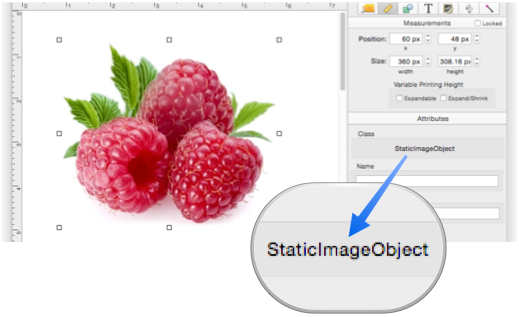 When you drag an image onto a form, this creates a special type of object, a Static Image object. There is no icon for Static Image in the Object Library, the only way to create one of these is by dragging an image onto the form. A Static Image object doesn’t have all the fancy options that an Image Display Object has, in fact, they have only one option Scale. Use the Scale to easily resize the image accurately to any scale you want, while maintaining its proportions. Of course you can also drag the object handles to any size and shape you want, which will distort the image. If you want to remove the distortion, just set the scale again (either with the slider or by typing in a scale). Panorama will automatically set the image back to its original proportions. 10.0 Updated Carried over from Panorama 6.0, but now allow images to be simply dragged onto the form. Also allows image to be scaled.